At least 352 people were arrested, while 968 others were detained over the past 7 days, according to Turkish news agencies. Police carried out the operations in at least 42 provinces across Turkey. 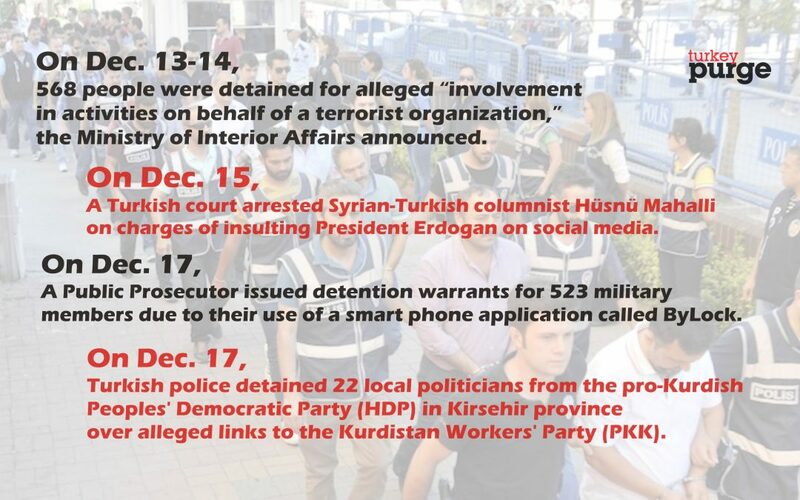 With most of the arrestees being pro-Kurdish politicians, those arrested over the past day also included civil servants, police officers, military members and businessmen. On Dec. 13-14, a total of 568 people were detained for alleged “terrorist propaganda and involvement in activities on behalf of the terrorist organization,” following a car-bomb attack in İstanbul claiming the 44 lives, the Ministry of Interior Affairs announced. On Dec 15, a Turkish court ruled on arrest of Syrian-Turkish columnist Hüsnü Mahalli on charges of insulting the president on TV and on his social media account. On Dec 16, a total of thirty district governors and candidates for the position have been arrested in Tokat as part of an investigation targeting the Gülen movement. On Dec 17, İstanbul Public Prosecutor’s Office issued detention warrants on Friday for 523 military members from the Turkish Armed Forces, including high-ranking officers, due to their use of a smart phone application called ByLock. On Dec 17, Turkish police detained 22 local politicians from the pro-Kurdish Peoples’ Democratic Party (HDP) in Kırşehir province over alleged links to the Kurdistan Workers’ Party (PKK).